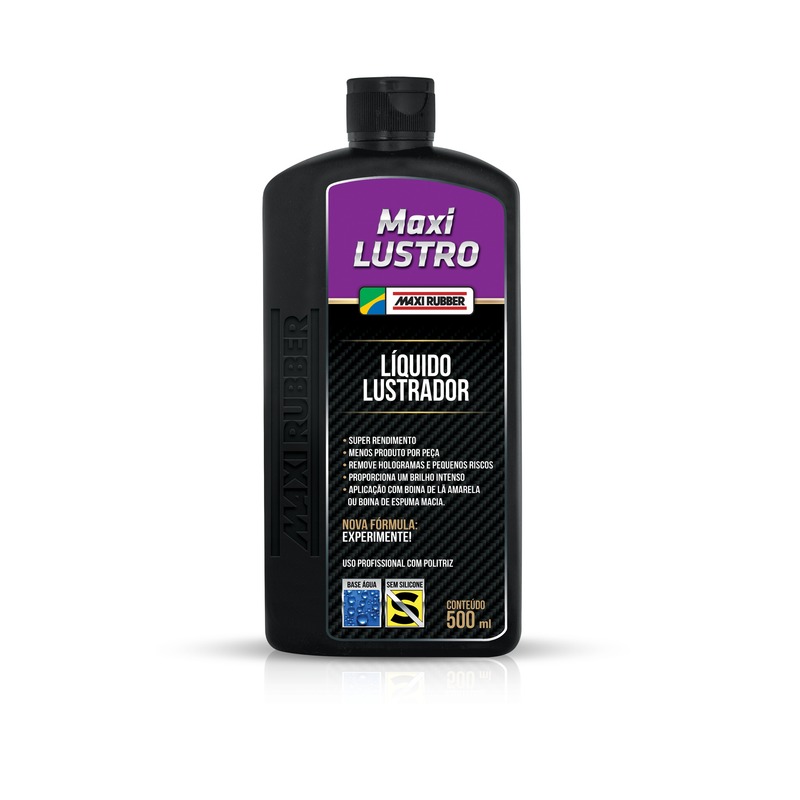 Indicated for all types of paintings, providing an intense glow in the finishing of automotive repainting polishing after the use of Maxi Rubber Maxi Lustro. Completely eliminates micro-risks, producing a great finishing even in darker-colored vehicles. Clean the surfaces using Maxi Rubber Degreasing Compound, eliminating traces of dust, oiliness, and other impurities that may compromise the performance of the product. • The surface to be worked on should be clean, dry and cold. • Shake the product well before using it. • Apply 4 to 5 drops of the product on the foam compound pad. • Work on small areas of approximately 60x60 cm. • Spread the product using the soft foam compound pad on the surface in circular movements, maintaining the equipment turned off. • Activate the polisher (600 - 1500-rpm rotation) and initiate the glow, moderately pressing it with overlapping movements. Reduce the pressure as the product dries out. • For a perfect finishing, use polishing cotton to access the parts which the polisher cannot reach. • If necessary, remove the excess of product residue on the compound pad using the Maxi Rubber Microfiber Cloth. • Apply a few drops of the product on the Maxi Rubber Microfiber Cloth, evenly spreading it on the surface with a slight pressure. • If necessary, remove the excess of product residue using the Maxi Rubber Microfiber Cloth. • If necessary, repeat the process until reaching the desired glow. • Residues are easily removed with water or wet cloth. • In the case of original painting or repainting recovered at approximately one month, Maxi Rubber Automotive Wax may be used after Maxi Glow, providing a better protection to the painting. 95 m²/gallon 10 to 15 cars (small size) for every 500 mL of product (it may vary according to the state of preservation of the vehicle). Water, mineral oil, vegetable oil, several solvents, aluminum silicate and additives.